At one point during the final presidential debate Wednesday night, Hillary Clinton referenced the Navy Seal raid that killed Osama bin Laden, the news of which superseded some regularly scheduled shows on May 1, 2011—including a new episode of the 11th season of The Celebrity Apprentice. But whatever got him to where he is now, the contrast that night between Trump, bloated and braying on NBC at the Real Housewives of Atlanta’s NeNe Leakes, and Obama, stately and serious on all the majors, announcing the successful operation against the country’s top enemy—the contrast couldn’t have been greater. And it was that contrast that Clinton has commented on at least twice this month, in the form of a one-liner designed to favorably contrast her experience with Trump’s. “When I was in the Situation Room monitoring the raid that brought Osama bin Laden to justice, he was hosting The Celebrity Apprentice,” she said again on Wednesday. And technically it’s true—the announcement did supersede NBC’s programming of the prerecorded ninth episode of the 2011 season (Lil’ Jon won $40,000 for his charity). But worse, it also superseded Trump at his most revealing—live on CNN, spewing birther nonsense to Don Lemon. Around the time Obama was getting ready to tell the country Osama bin Laden was dead, Trump was blaming “the press” for his unquenchable desire to see Barack Obama’s longform birth certificate. “Instead of talking about my strength, which is exactly that, and dealing with people so we become a rich country again, every time I go on, they start talking about the birther issue,” Trump said. 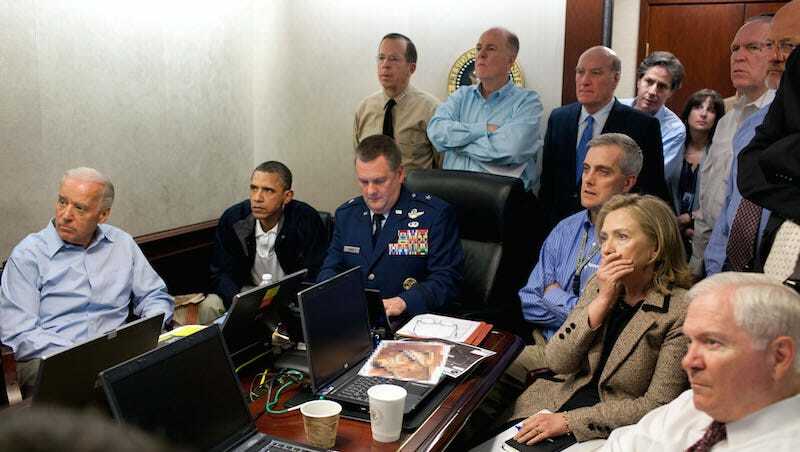 Then he hung up and the show cut to the bin Laden news. On September 16, 2016, Trump officially announced he believed President Obama was born in the United States and blamed Hillary Clinton for starting the rumor in the first place. Osama bin Laden had been dead for more than five years.